A tote made from handwoven textile (using 6-pedal floor loom) and clear vinyl sheets. The gusset pieces are made with cut warp yarns, and the bag handles are also handmade from scratch. The main materials for this DIY Accessories project were two spools of 6/2 unmercerized cotton yarn, clear vinyl sheets, and some remnants to create bag handles from. Basic machine and hand sewing supplies completed the list. Read more about this project by visiting DIY Handwoven Tote with Vinyl Cover post. 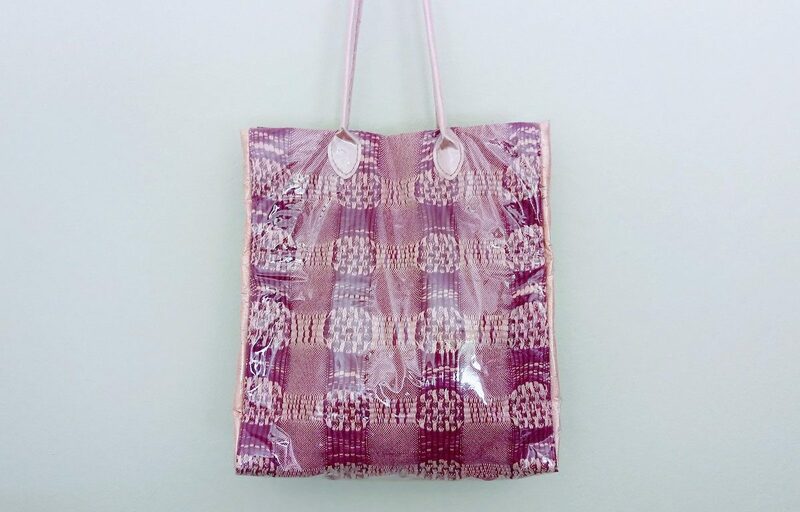 Handwoven tote bag with clear vinyl cover made with my latest textile piece from weaving class. The gusset pieces are made with extra warp yarns, and the bag handles are handmade.